Nassos Triantafyllou is the best cycling photographer in Greece. But that doesn’t mean he can quit his day job. Nassos and his brother own a parking garage next to the Acropolis citadel. They bought it in 2002. It was a dump. After installing new elevators and renovating the floors and walls they opened up shop in 2004. Business was good. They are the closest parking lot to the main attraction of the ancient city of Athens. But then came the crisis and no-one in Greece was sure of an income. Even the owners of the most popular parking lot in Athens. The crisis of 2010 hit Greece hard. Evidence of the dramatic drop in expendable income is visible when we drive out of the capital, towards the Peloponnese peninsula. Unfinished buildings, rubbish and a complete lack of highway entertainment like roadside restaurants and advertisements. I realize how much I take convenience and service for granted and what a brave move my Greek hosts have made with this new cycling venture. Tom and Nassos just picked me up from Athens International Airport. We are now driving from the mainland of Greece to its largest peninsula, Peloponnesos. 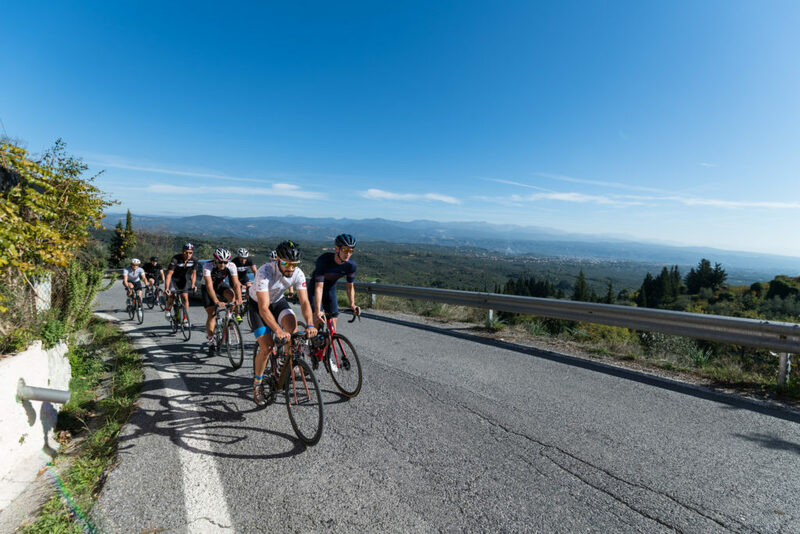 The peninsulas mountainous interior and fertile valleys make it an awesome playground for avid cyclists. 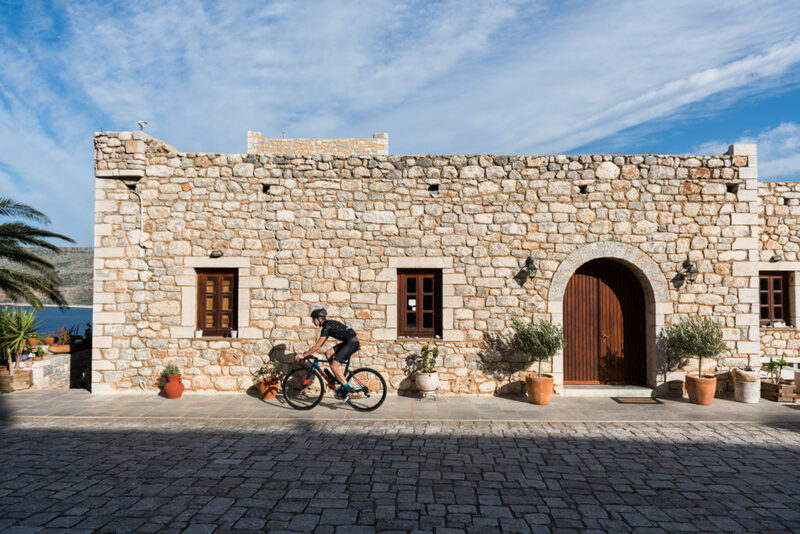 Consequently, it is the ideal location for Pedal Greece, founded by Tom and Agi, to take their guest out for three days of cycling. There is a toll station about every 40 kilometres. But hey, the highway is brand new. In fact, almost every Greek highway now in use, has been completed in the last 4 or 5 years. Before that, cars drove over the rough roads we see winding through the hills. It used to take 5 hours to get from Athens to Kalamata. Now it’s 2,5. Saving time is a big deal in a struggling economy. We are just a hour out of Athens and find ourselves surrounded by deep valleys and wide open spaces. The mood in the car is positive. My hosts are on a mission. There is more to their country than beach resorts, olives, ouzo and a bunch of terribly old buildings. And they are determined to show me. They are intensely proud of the diverse beauty of their untouched inlands. We are just a hour out of Athens and find ourselves surrounded by deep valleys and wide open spaces. Greece is incredibly mountainous. And the views are stunning. I look out the car window and imagine the feel of the warm wind on my face as I descend into one of those spectacular valleys. I look out the car window and imagine the feel of the warm wind on my face as I descend into one of those spectacular valleys. There is no cycling culture to speak of in Greece. 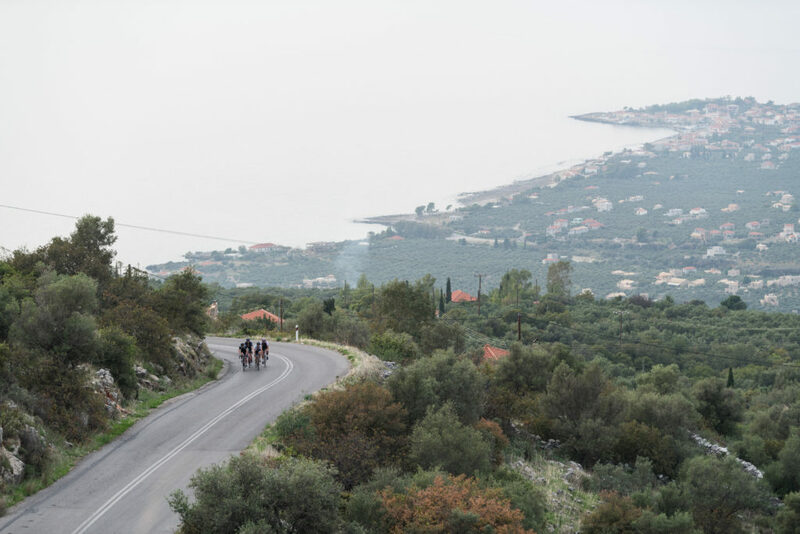 A few elite teams like the Seg Academy, a Dutch organisation working with under 23’s, use the Greek roads as their winter training grounds. Greece has a national team in all cycling disciplines, but they are not super active on the international events, due to lack of funding. Christos Volikakis, a very successful track sprinter worldwide, receives no funding from the state and relies on private funding to train and compete. I ask about Greek cycling races and told about the (International) Tour of Hellas. First held in 1968 and thereafter organised in 1981 and every year until in 2012, when it was given an UCI 2.2 status. Unfortunately, funding was cancelled that year and the cycling world stopped seeing Greece as a cycling destination. In our three days on the road, I don’t see a single cyclists other than our own crew. So I am surprised at the friendliness and consideration from other road users. We are greeted, even cheered on. 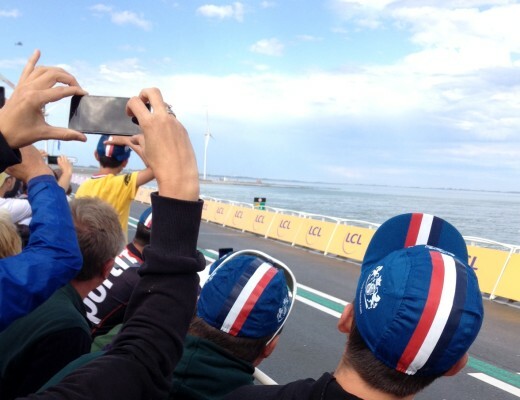 Cars slow right down and give our small peloton plenty of space. Maybe it’s because we’re a novelty here, or maybe the Greek road users are just lovely, patient people. Probably both. Greece it is the third most mountainous country in Europe, following Norway and Albania. 80% is elevated area. 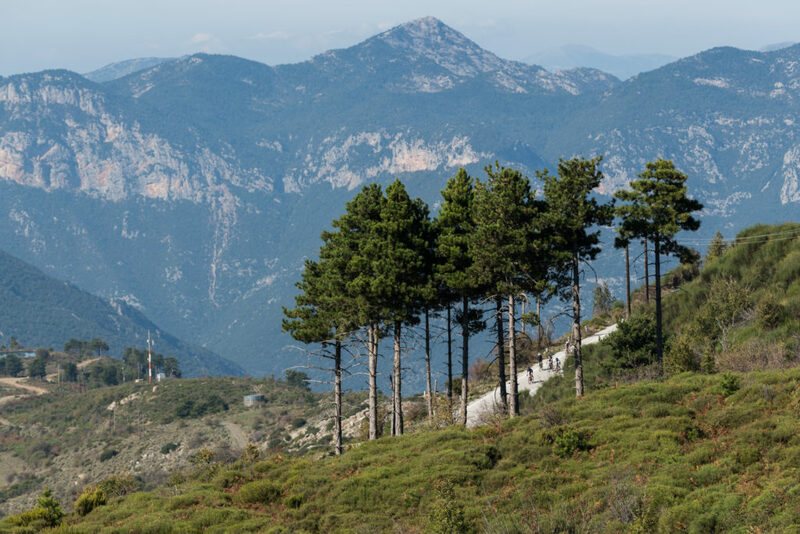 We drive into Sparta (or Sparti), located to the south of the Peloponnese peninsula. Two thirds of the Peninsula is mountainous terrain. This comes as a surprise to me. Greece is famous for its islands, seaside and beach resorts, but in fact, Greece it is the third most mountainous country in Europe, following Norway and Albania. 80% is elevated area. 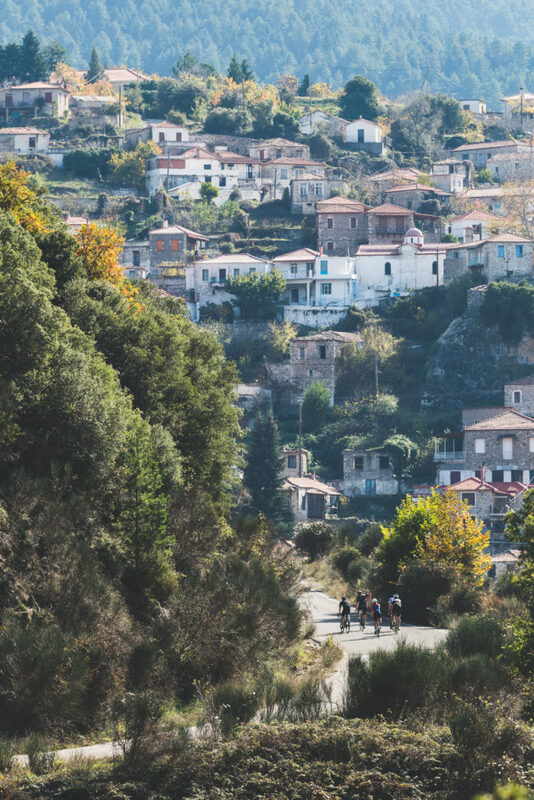 I will find out soon that this is only one of many reasons you should add Greece to your cycling bucket list. Sparta evokes strong associations with a doctrine of dedication, soberness and restraint. The Spartan upbringing was a community matter. Weakly and handicapped children were killed and those that made the cut were trained to become the supremely fit and strong Spartan warriors we know from ancient legends. As we drive into town, we see crowds of super toned men and women walk the streets. Turns out the Spartan Trifecta World Championship are on this weekend. Athletes from all over the world have gathered to find glory in the ancient homeland of the Spartans. It seems fitting. 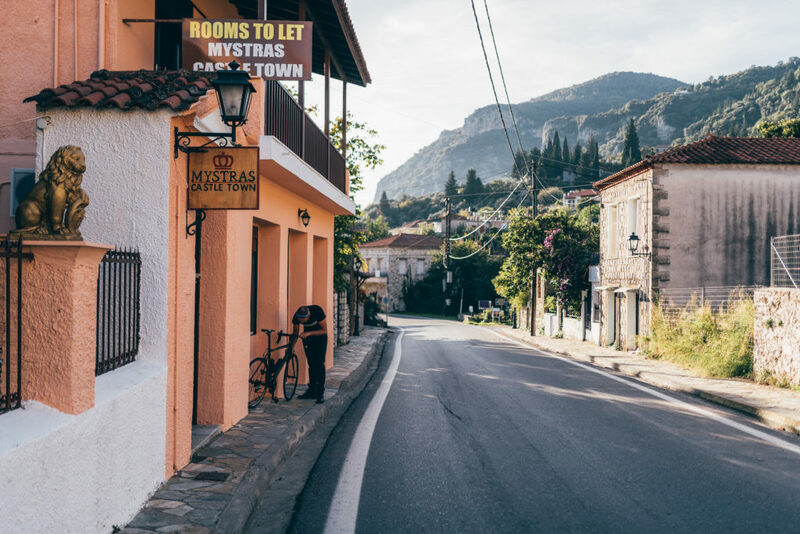 We drive on, up into the hills and settle into a bed & breakfast in Mystras town for the night. Not too early the next morning we head out into the beaming sun for a loop around the Parnonas mountain range north of Sparta. We can’t believe our luck, it’s early November and we’re in summer kits. The roads are dead quiet and the wide views are unrelentingly beautiful. Every turn offers something new: a deep valley, a wide stretch of soft curving hills in the distance, a lone gathering of farm buildings with orange tiled roofs. We pass through forgotten villages perched up against the hills, and dash over their cobbled roads. The known world is so far from here. In reality, we are a mere three hours drive from the bustling and chaotic Greek capital. I’m cycling with four of the fastest guys in Greece, fit as a fiddle, and deaf to my pleas to drop me. The ancient metropolis of Athens is best known for its remains of antiquity. The Acropolis, Ancient Agora, and impressive temples of Hephaestus and Zeus are the biggest attractions of the Greek capital, perhaps of Greece itself. But remains of ancient civilisation can actually be found everywhere, dating from far before Christ. On the morning of day two, we walk through the late Byzantine city of Mystras, 7k west of Sparta. Here, I start to get a deeper sense of life in historical times. It is now a ghost town, and I free to roam through its buildings and into the temples. I can almost conjure up the buzz of everyday life in the 13th century. Mystras is perched on top of a spur of the Taigetos. This vast mountain ridge, peaking at 2400m, lies between the Peloponnese departments of Lakonía and Messinia. High up in the Taigetos is where unfit Spartan babies were left to die. There is only one road to take you up and over the Taigetos. It’s a fantastic 16k climb, starting in the lush farmlands west of Sparta and leading into a treacherous looking rocky gorge with steep drops. 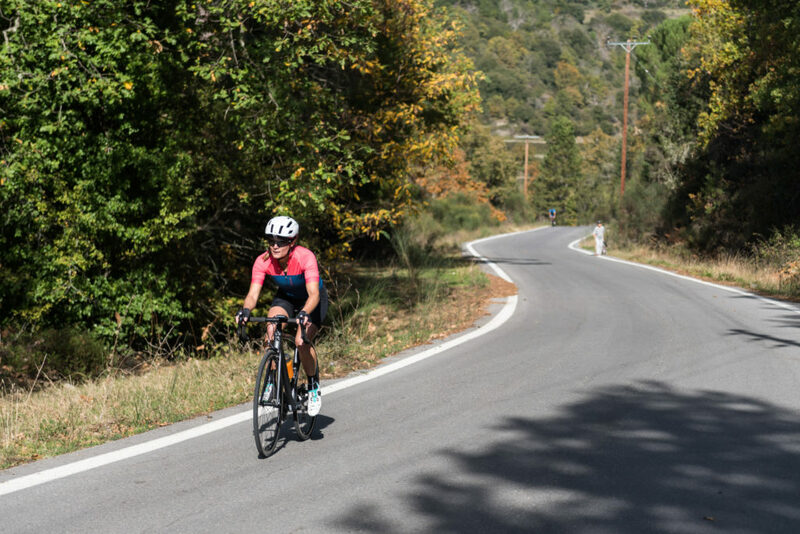 With the magical sights of Mystras fresh in our memories, and a slight stiffness in our legs from a long day in the saddle, we head into the first steep section going up into the Taigetos. After a solid 1,5 hour of climbing I notice that the air is getting thinner and the vegetation sparse. I’m glad to have made it to the top. I’m cycling with four of the fastest guys in Greece, fit as a fiddle, and deaf to my pleas to drop me. So I give it all I have and take the QOM on the Spartan Climb. Mind you, only two other women have cycled up here, so Strava tells me. Up here in the mountains I’m reminded of a cycling day in the Pyrenees. I can’t believe how unprepared I was for the feast of mountainous terrain Greece has to offer. The grandeur of the Taigetos ridge is far beyond my expectations. Up on Mt. Taigetos, we recharge on pastry dripping with honey and handfuls of freshly roasted nuts. Then we head into the decent. 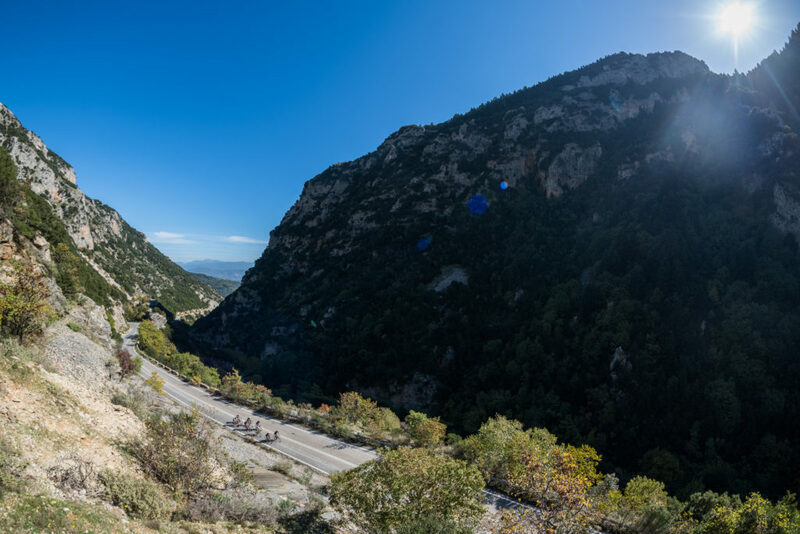 Leading down from the mountain pass is a lovely smooth open road with wide hair pins taking you all the way to the city of Kalamata. Famous for its olives of course, but also for its unspoilt coast and impossibly clear seawater. 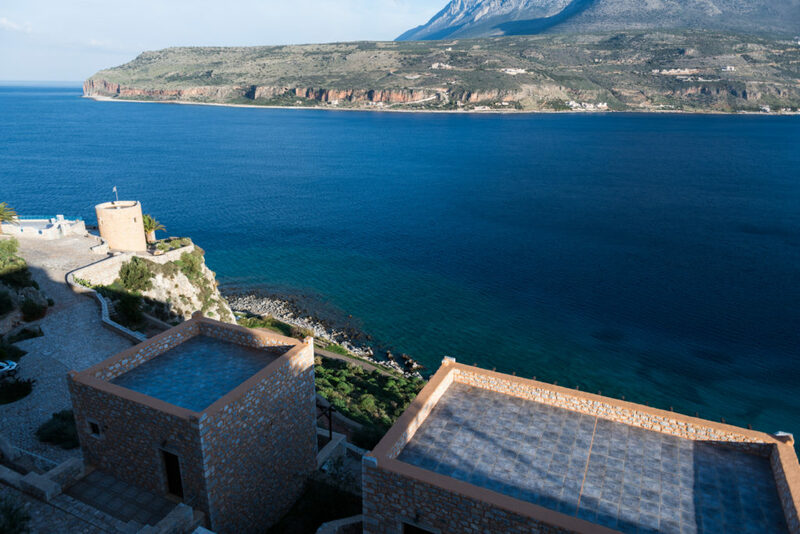 From Kalamata we choose the road leading south along the coast, taking us out of the city and on to Mani, one of the four south-pointing peninsulas of the Peloponnese. Until recently many Mani villages could be reached only by sea. Today a narrow and winding road extends along the rocky bays of the west coast from Kalamata to Areopoli. I’m excited for each new vista waiting for me at the next hillcrest. With every kilometer the road becomes more quiet, and just before dusk we reach Limeni, our final destination for the day. We steal a quick dip into the clear water and wash the sweat off our sticky skin. I am spent, and it feels lovely. My head is saturated with the day’s impressions and my legs are weary form the many vertical k’s. Time to check in and grab a Hellas beer. Limeni is a tiny and very picturesque port town. Said to be the prettiest of the whole Mani peninsula. Medieval villages are scattered throughout the 72 km long and narrow middle prong of the south Peloponnese. Mani has a complicated history of hardship and blood-letting, which has cultivated a strong independent population, the Maniots. Their wild and rugged region is incredibly unspoilt. Building projects are carried out with respect for the character of the area. The luxury resort where we rest our legs, is build up of 16 stone towers housing 2 studio’s each. It has a swimming pool overlooking the bright blue bay and a large restaurant and lounge area. Still, it blends in with the surroundings perfectly. The smaller hotels, and a few restaurants, are housed in the renovated buildings of the fishing port of Limeni. At this time of year, we are the restaurant’s only guests. For our mains we walk over to the glass display counter and choose from the catch of the day. 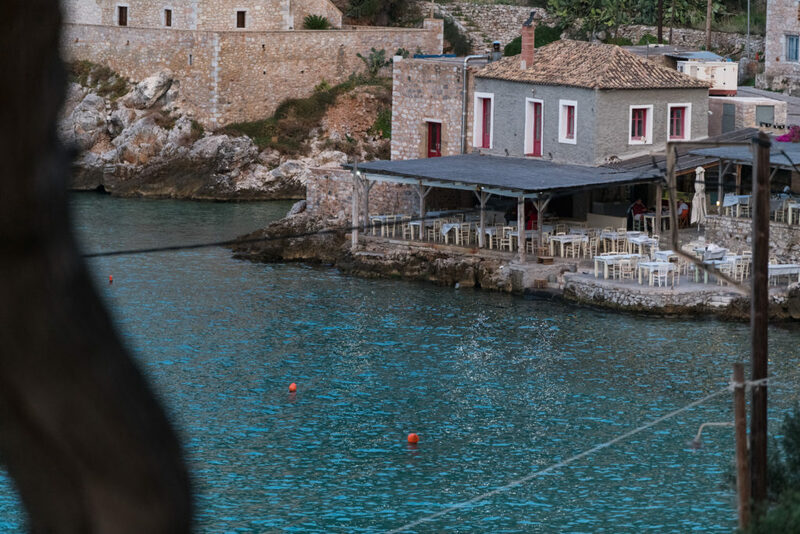 The fish are then scaled and washed on the restaurant’s terrace stairs, which lead into the seawater, and grilled and cooked to perfection. I am filled with warmth for these people and this country and it’s not just because of the bottles of ouzo that are passed around. 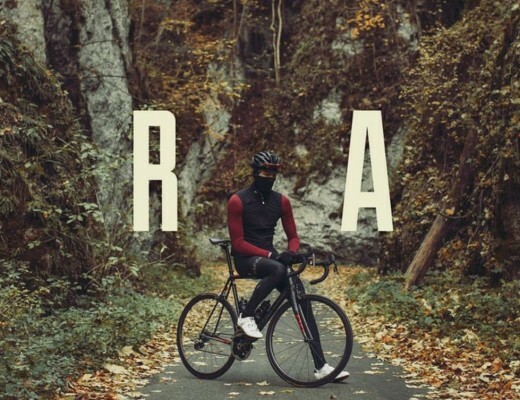 They are determined to show the world a better side of Greece and in particular, for cyclists to experience their rich culture and magnificent roads. 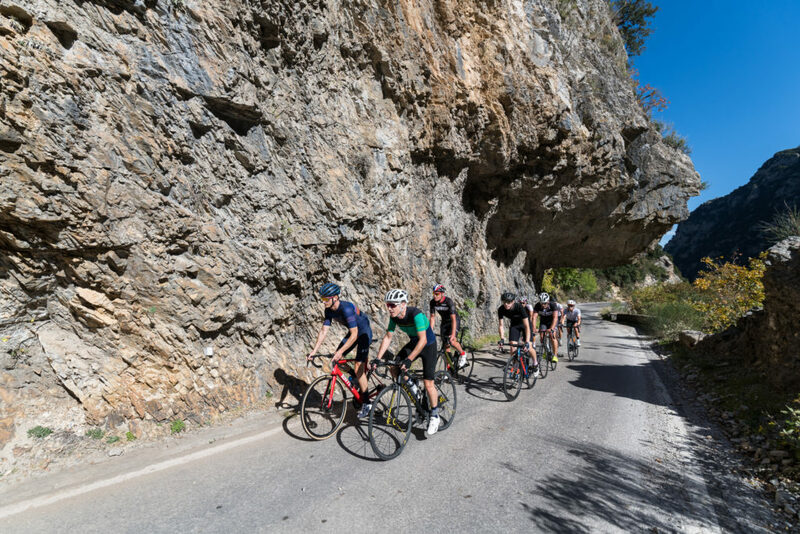 Pedal Greece wants to cater to the experienced road cyclist, looking for a new cycling adventure. They want to be the next Mallorca, or perhaps, the better alternative. And if you ask me, they have a shot. Fully recharged and rested after a good night’s sleep, we grab our bikes. On our last day we will be exploring the backroads of Mani. We take just one climb up from the sea and then dive into the hinterlands, over roads less travelled. We pass families carrying large nets around their olive orchards, placing them carefully to catch all the falling olives. The more gnarly and rugged the trunk looks, the older the tree. 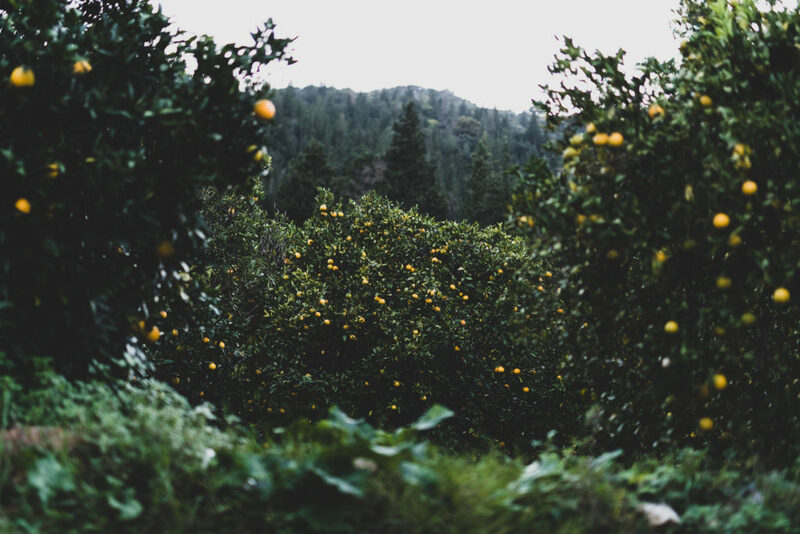 First cultivated about 7000 years ago, some trees in Greece are said to be 2000 years old. That was about the time Jesus Christ was walking the earth. It’s inconceivable, I know. Back in Athens we pay a last visit to 48×17 Cycles, the only hip bike store in Athens, owned by our host Agi. The store is filled with all sorts of frames and paraphernalia. Agi is an avid collector of obscure and vintage bike parts. 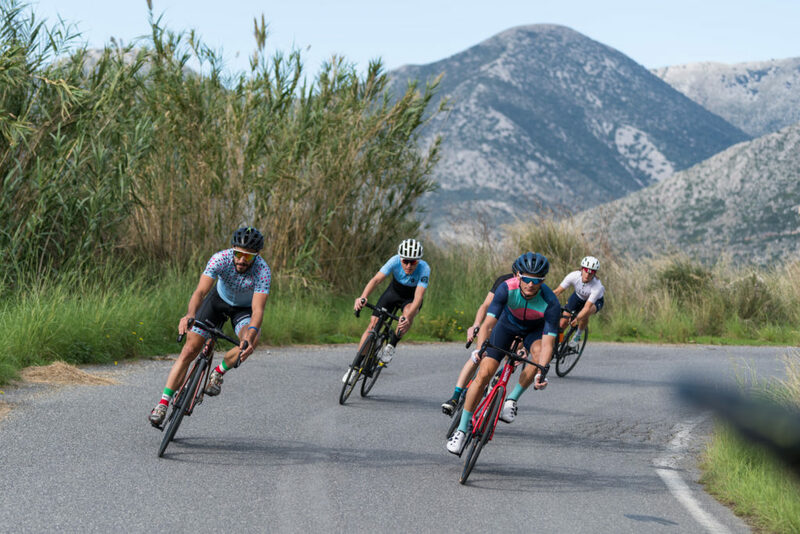 Every other year, Agi organises his Classic Marathon Race Revival, Athens’ premier track bike street race, in honor of the first modern Olympic games in 1896. In that year a Greek Cyclist by the name of Aristidis Konstantinidis, won the (unpaved)road race. He fell of his bike and crossed the finish line in a bloodied and bruised state. But that’s a different story. Agi and Tom initiated Pedal Greece, offering all inclusive cycling holidays, because they know Greece has more to offer than people know. The diversity of its terrain and the unparalleled heritage add a deep sense of culture to your cycling experience. 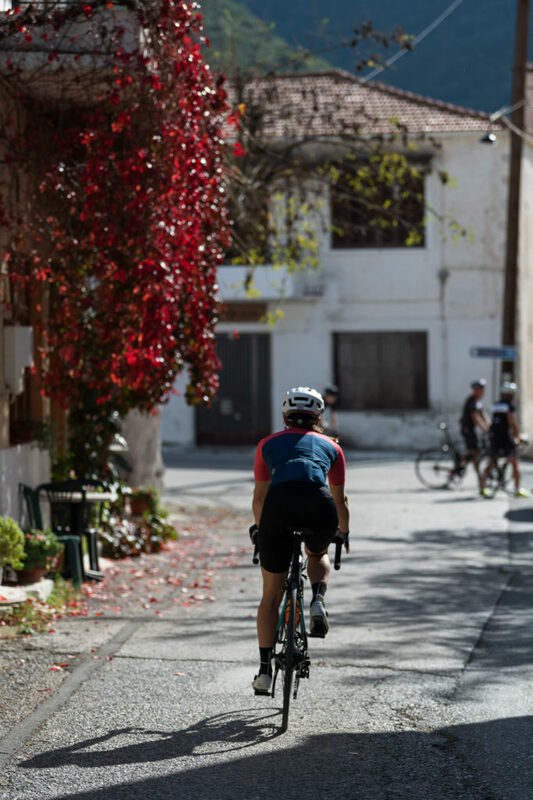 The Peloponnese, where you can steal a bright orange mandarin from a branch hovering over your breakfast table, is more than a collection of roads you want to ride. Life feels rich here in on the peninsula. Rich with history, rich with culture, rich with the smells of tasty foods. Endless fields of ancient olive trees, the source of the world with the best olive oils. There is plenty of wine to drink and and a vast landscape to be explored. Most likely as the king and queen of the road. 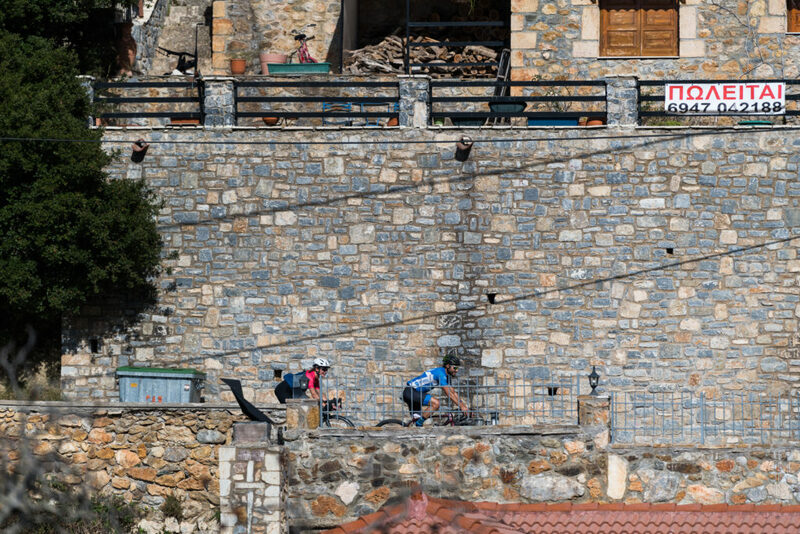 Go and enjoy the Peloponnese, before the rest of the cycling world finds out.